St. Louis is one of the rare, lucky Midwestern cities with light rail. The city seeded its Metrolink system in the 1990s and underwent a pretty large expansion in the early 2000s. It now has 37 stations. Unfortunately, a weak local real estate market has hindered growth near stations, and ridership hasn’t reached its potential. 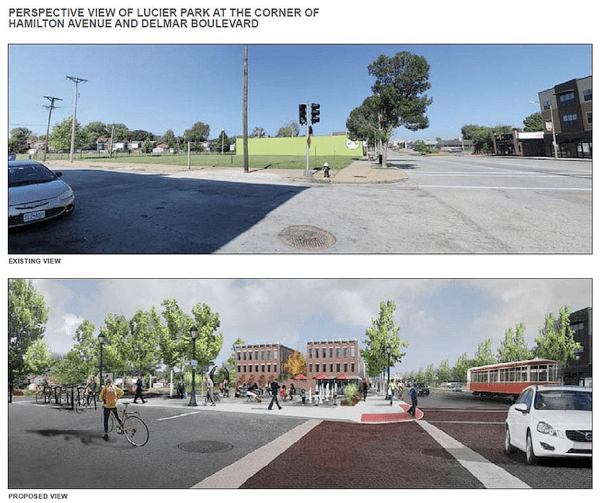 But with help from a HUD grant, the city of St. Louis has been putting together some ideas to spur walkable, mixed-use development near stations, including the elimination of parking minimums. 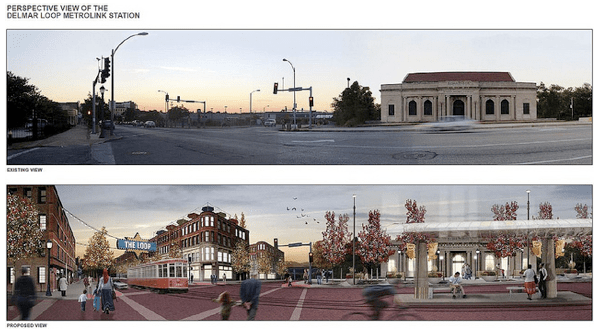 With both Red and Blue MetroLink lines, six bus routes, and the forthcoming Loop Trolley the Skinker-DeBaliviere neighborhood and area near the Delmar and Forest Park MetroLink stations offers the best opportunity for TOD in the region. In the 20 years that MetroLink has been running, little development (many rehabs though) has occurred near the Delmar and Forest Park stations. Forces greater than the MetroLink, at play for much longer than the last two decades, have stymied development potential. Read Mapping Decline for a melancholy account of St. Louis’ 20th Century slide. Finally the tide is turning. There is greater recognition that silver-bullet projects, building more and more highway lane-miles, throwing away old neighborhoods, and spreading our jobs and housing out thinner and thinner isn’t working well. We simply have to encourage development that is more financially productive in order to have any hope of maintaining the infrastructure and funding the government services we expect (for more on financially resilient cities see strongtowns.org). Also technological advances, environmental concerns, and an economic boom hangover are changing housing, lifestyle, and transportation preferences. The dedication to fostering the strong neighborhood in the study area puts it in a position to capitalize on these shifts. The developments envisioned in the TOD plan may now be more realistic than ever. Perhaps most importantly, the plan introduces a form-based code for the area. A form-based code regulates the physical form of buildings rather than just their use. For a new development at a given site, the code would provide a range of heights, the setback from the street. The code would not include minimum parking requirements, instead allowing developers to build to suit the market. This regulatory scheme will help to foster the types of developments outlined in the plan. Elsewhere on the Network today: Bike Portland looks back at the first year of the Green Lane Project, aimed at boosting protected bike infrastructure in that city and five others. The State Smart Transportation Initiative reports that the Federal Transit Administration is taking steps to encourage communities to link transit and affordable housing. And the Alliance for Walking and Biking offers a glimpse of Montana’s efforts to encourage cycling. Denver Is Your 2017 Parking Madness Champ! Denver's monster parking crater is a classic of wasted urban potential: a huge swathe of land close to downtown, served by three light rail stations, and overwhelmed by massive parking lots for sports stadiums that barely get used much of the year.